Like the original YI Action Camera, the YI 4K comes with WiFi and uses the same Android and iOS app. While the app was necessary for the original YI camera because it did not have a screen, the YI 4K comes with a 2.19″ touchscreen with a very easy to use menu. The camera also comes with a G-sensor. Size is slightly bigger at 65 x 42 x 21mm then the original YI. Some other features are a large capacity 1400 mAh battery and electronic image stabilization (does not work at 4K resolution). Unfortunately, like GoPro cameras, the YI 4K makes an excellent action camera but it is not ideal as a dash cam. While the camera has loop recording, auto start / stop has not been implemented as of yet. Also while the camera comes in black (white and rose as well), it is not the most discreet form factor as a dash cam. Note there is a Chinese and International version of this camera. As of this time there is no known way to convert a Chinese version to an International version. Be sure to purchase the International version, otherwise all the menus will be in Chinese. Some owners have indicated that water can get into the waterproof case as described in this thread. This does not appear to be widespread but could be due to a damaged O-ring on the waterproof case. To be on the safe side you may want to place a piece of paper in the waterproof case and put it underwater to check for leaks prior to using it underwater with the camera. If you are looking for a true 4K (2160p) camera and have adequate hardware to watch and edit videos, the YI 4K is an excellent camera. While it is pricey at approximately $250, it is a reasonable price for a 2160p camera. Video quality is on par with more expensive cameras and the YI 4K makes an excellent action camera. It has excellent battery life as well, a screen and a simple to use WiFi app making this an all around excellent camera. Unfortunately without auto start / stop capability the YI 4K is not suitable as a dash camera. Overall a great alternative to a GoPro camera and is a reasonable choice if you are looking for a 4K action camera, assuming you have already invested in hardware to view and edit 4K videos . See what other owners of this camera have to say on our YI 4K Action Camera Forum. WARNING! MAKING CHANGES TO YOUR FIRMWARE ARE PERFORMED AT YOUR OWN RISK. WE ARE NOT RESPONSIBLE FOR ANY DAMAGE TO YOUR DASH CAM AS A RESULT OF THESE INSTRUCTIONS. The English user manual can be downloaded here. 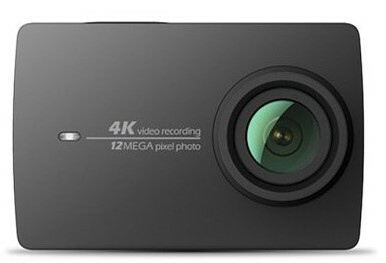 Final Word If you are looking for a true 4K (2160p) camera and have adequate hardware to watch and edit videos, the YI 4K is an excellent action camera.